Questions Related To Reef Aquaria – Sticky Post #2. I will be glad to attempt to answer any questions related to reef aquaria. HOWEVER, THERE ARE SOME PRECONDITIONS AND CAVEATS! Each single answer – no matter how trivial – will cost a $5.00 fee. This should be transferred – in advance – to my PayPal account. A not-so-useful form (which keeps the spammers off the track a bit) of my email address is: ronshimek-at-wispwest-dot-net (and I am sure any reader will convert that into the actual address). When the fee is deposited in my PayPal account, I am sent notification of that transaction, along with an email address of the person depositing the fee. I will reply to that email address, asking the sender what is the question, and the “game” will begin. In other words, PLEASE DON”T POST THE QUESTION AS A COMMENT IN MY BLOG. I will answer each question to the best of my ability, but I make no guarantee that the answer is correct. Likewise, I assume neither responsibility nor liability for any changes or problems that may occur in your aquarium system as a result of your actions based on my answers. Other than specified below, there will be no refunds if you are not satisfied with the answer. As the old carnival talkers would say, “You pays your money and you takes your chances”. I will read the question before I attempt to answer it, and if the question as sent to me has multiple parts; I will contact the questioner and point this out. The questioner may then specify which single part should be answered for their fee. Some questions have no possible answers. For those questions, I will return the fee minus any PayPal transaction fees. THE EXCEPTION TO THIS RULE IS: ANY QUESTION ABOUT AN ORGANISM THAT REQUIRES ME TO EITHER SPECIFICALLY OR IMPLICTLY IDENTIFY THE ORGANISM WILL NOT BE REFUNDED EVEN IF I CAN’T IDENTIFY THE ORGANISM. Such questions involve an expenditure (sometimes a significant expenditure) of time, and that is what the fee covers. Any single question may be discussed or explained in detail, but any additional questions will cost more $$. those bloodsuckers, bar none – Pyramidellid snails. Whether or not I develop this article fully depends on a lot of things, not the least of which the direction my muse (and I do have one – a characteristic I find “amusing”… 🙂 ), takes me. And also, of course, whether or not, I can find an editor who will accept it. Anyway I am still in the very early stages of this thing, and I am trying to find some more background information about Pyrams. Now, like Yogi, I figure I am a bit “better than the average bear” with my knowledge of the group, but I really need to know more before I do anything that can be considered to be a reasonable and – hopefully – entertaining article about them. Basically, the Gastropod family Pyramidellidae is a very large group of small… white… snails without any really nice identifying characteristics. There are, quite literally, thousands of names applied to these snails, and how those names relate to the actual species – if any – of those snails is really open to question. As with many marine groups – probably as with MOST marine groups – of animals, they are a taxonomic mess. There are three basic reasons for this, the primary one is that they are all – dare I say it, again – small, white, and feature-less snails. If you think about it, once you have the basic constraints of a small, helically-coiled, shell, there are NOT a lot of ways that those constraints can be varied. In point of fact, back in the 1960s, a paleontologist named David Raup, wrote a series of nice papers noting that virtually all marine animals with a “shell” can be easily described mathematically (Raup, 1962; 1966; 1969). 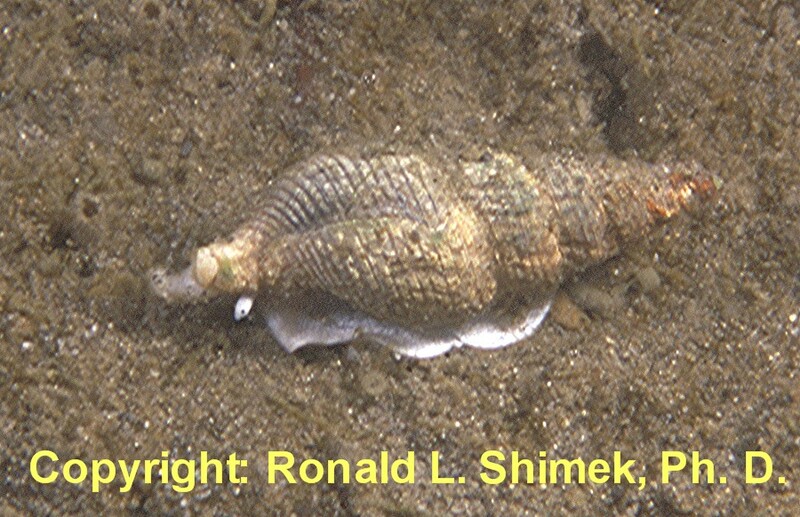 The term “shell” in this sense is restrictive and excludes arthropods – even though they are “shellfish” they don’t have a “shell” in the way that Raup meant: “a non-living external covering to the animal.” What arthropods have is an “integument” – a covering that is made of an intricate and complex fusion of living and secreted elements that is an integral part of the animal’s body, interiorally and exteriorly. If you try to remove a shrimp’s “shell,” you are left with a mass of dead flesh. If you try to remove a snail’s or a clam’s shell, you will find that, in many cases, it is quite possible to do this and still have a living animal. And that animal may remain alive – in the case of some snails – indefinitely. Clams without a shell perish in short order, as they can’t feed. But snails without a shell can generally do everything shelled animals can do. Everything, that is, except withstand the bite of a predator’s jaws. Virtually every biologist who studies large populations of marine snails occasionally finds a shell-less one; probably an animal whose shell was eroded away by a sponge, or whose shell was cracked by a crab and, by a miracle, the shell was removed. As an example, over the course of three years, I encountered two almost-naked specimens in one species, Ophiodermella inermis, that I worked on many years ago. 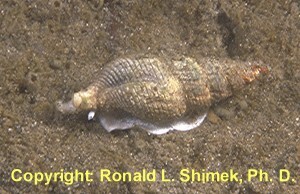 Ophiodermella inermis, photographed in Dyes Inlet, Washington. 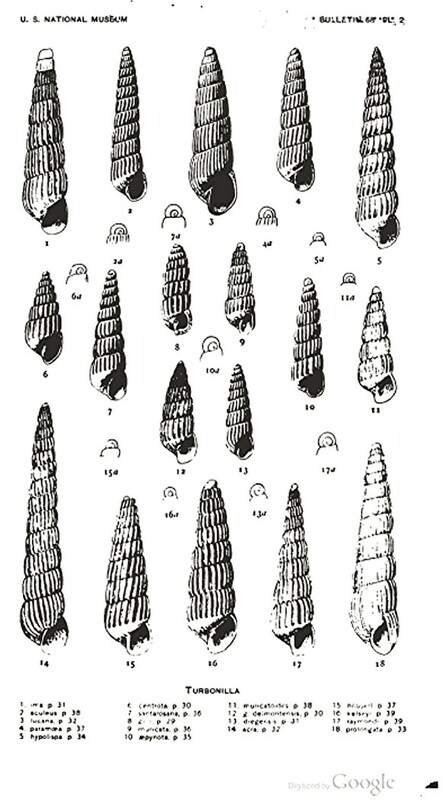 Anyway… Raup found that virtually all mollusk and brachiopod shells were basically helical in shape, and that all fundamental shell shapes could be described by only three parameters, 1) the shape of the shell’s aperture, 2) the rate at which the shell’s aperature coiled around the central axis, giving the width of the animal, and 3) the rate at which the coiling moved along the central axis which determines the animal’s length. As all of the functions occur simultaneously, how each of the parameters varies in relationship to the others changes both the absolute and relative proportions of the shell’s shape. This diagram below shows how the shell parameters determine the difference in shell shapes for some snails commonly found in marine reef aquariums. The top shows a Nerite; here the shell aperture just moves in a spiral around the axis of coiling and moves outward at a rate that is not very large. This results in a spirally-coiled shell where the whorls appear to overlap. The other shells are trochoideans. And here the parameter of “aperture shape” is circular. The aperture moves around the axis of coiling at various rates – giving a turbinate or trochoid shape. Additionally, the aperture moves along the axis of coiling determining whether the shell is squat or elongate. 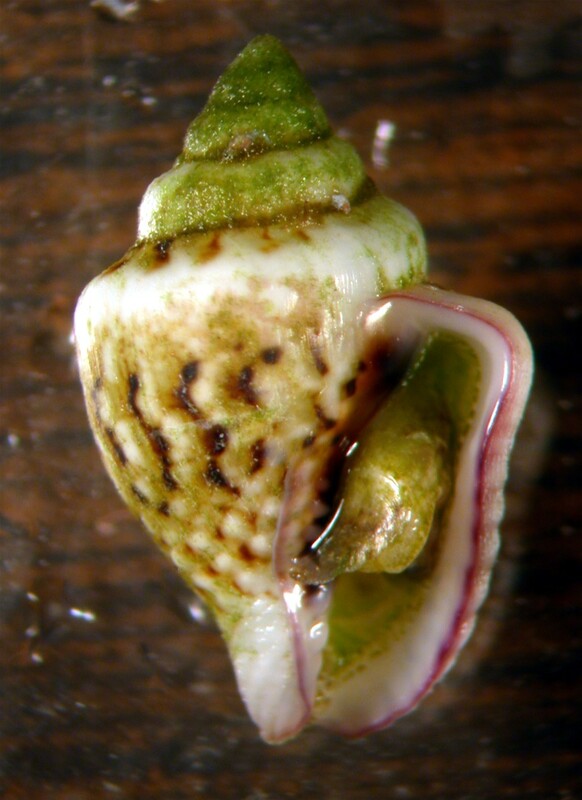 Although the flat Stomatella seems to be very different from a conical Trochus in structure, with a little thought, it is easily possible to see how those shell shapes are related. 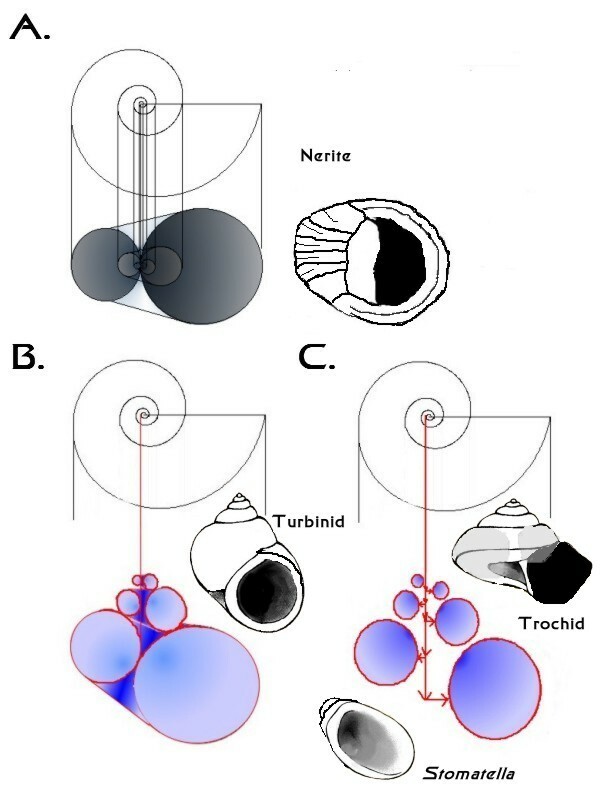 .Shell parameters illustrated by various snail shells; all shells grow in three dimensions but the position of the aperture in each successive whorl may change due to only 3 parameters. A. Growth of a shell where the aperture shape moves in a spiral within one plane; the nerite shell is an example of this. B. Here the aperture moves along the axis of coiling but remains tangent to that axis; the illustrated turbinid is an example of that growth. C. Here the aperture moves along the axis of coiling, but also translates or moves outward from that central axis. An opening called an umbilicus in the center of the shell is the result. The illustrated trochid shows this growth form, with the earlier positions of the growth generating aperture shown in gray. The shell of Stomatella is auriform, an extreme example of the prominence of the whorl translation rate. Given that all molluscan shells can be basically described in this manner, if shells lack much distinctive coloring, sculturing, or extra ornamentation, it should be apparent that there really are not a lot discrete characteristics that can be used to uniqually differentiate any given shell from all others that are basically similar in shape. That lack of potential characters is the first factor that has caused taxonomic problems with pyramidellid shells. The second and third problems were two malacologists, William Healey Dall and Paul Bartsch. Dall was the first curator of mollusks at the United States National Museum (aka the Smithsonian Institution). Bartsch was his “disciple” and successor. As curators at the Smithsonian, a lot (really A LOT!!!) of specimens (= dead shells) were sent to them by various collectors. As they tried to identify these shells, they often found that the shells were not “quite” like shells in the museum’s collection – or in other museums’ collections. This meant that these shells were then new to science and needed to be taxonomically, or scientifically, described. Virtually all animals that are described from United States regions or by American authors have representative or “type” specimens deposited in the Smithsonian’s collections, so they had a lot of comparative material. Presently, that is a huge number of specimens, several millions. Back in Dall’s time, the collections were a lot smaller… but still relatively very large… So, they had a lot of material with which to compare any given specimen in their descriptions. Thus, if they decided a given specimen was a “new” species the odds would seem to favor the fact that it was new. Typically what these two ol’ boys did, was to let specimens accumulate until they had enough to write a short (or sometimes very LONG paper describing them all). At the time, the custom was to describe a molluscan species on the basis of one shell. The type was supposedly an “average” or representative shell that “typified” the species. By the way, Dall and Bartsch were by no means alone in the way in which they described “their” species. It was the standard method of the era. They were, however, especially prolific, and it seems, especially “gifted” with the inability to find unique precise and useful descriptive terms. Simply put, many of their descriptions are “precisely ambiguous,” they are written in ways that seem to precisely describe the specimen, but which don’t allow a reader to determine if a given questionable shell that they are holding in their hand is from that unique species. I think this was because they didn’t include much or any information addressing variations between specimens of the same species. And what about those variations? Well, Dall, at least paid lip service to the concept of variation, but he generally didn’t include any useful way to describe variations in the species he described. Any good field biologist knows that variation is quite literally “the stuff of life.” For example, for little white snails, such as pyrams, if one collects one hundred specimens from a known species, they will vary in length, width, the number of whorls, slight color variations occur, the proportion of length to width will vary a bit, the number of ribs on whorl may vary, and on and on and on… One specimen really can’t do it. Nonetheless, the conception of a species at the time, which was reinforced by rules of Linnaean taxonomy implied that there was no variation in a species. This was a result of considering all species to be divinely created. If a creator designed each species, he/she/it/they would obviously get it right the first time and there could be no variation. That was all fine and dandy up until the publication of The Origin of Species in 1859. Once the concept of evolution became established, the concept of a species HAD to include variation. And so it did. But in practice… Well, let’s just say the idea of variability in a species was not an easy one to get across. Modern descriptive statistics is just that, modern, so at that time there was no formal way to estimate variability. The concept of a standard deviation wasn’t there. Even including a range of sizes in a species description was rarely done. In essence, for any species – the idea of that species was “crystalized” within a single typical specimen, the type. Over his lifetime, Dall described 5,302 species in every group of animals defined at the time, from mammals to mollusks. Most, however, were snails. Bartsch described an additional 905. The heyday of these descriptions extended from the 1870s through about 1925 for Dall (several years after he died, actually, as Bartsch published some of Dall’s descriptions after his death). Bartsch retired in 1945 and died in 1960, and I think his last taxonomic publications were in the 1950s. Modern day molluscan taxonomists who work in the Pacific where these men had the largest taxonomic effect have a love-hate relationship with them. Love…about 0.000001%, Hate… well, do the subtraction. Simply put, it is essentially impossible to differentiate most small snail species described by these men. They gave lip service to the concept of species variability, but using the typological approach and their writing style such variability was impossible to descibe. Interestingly enough, that is not the case with many other prolific describers of molluscan species that were writing at the same time. Henry Pilsbry was another malacologist who described a lot of species; according to his article in Wikipedia, he wrote over 3,000 scientific papers and described over 5,000 species. His descriptions have stood the test of time well, so the problems with Dall and Bartsch were due to Dall and Bartsch. For example, if a large collection of pyramidellids or other small snails is taken from one bay or locality, their parameters will vary, of course. If those specimens can be determined by other means (ecological parameters, for example) they are all found to by one species, it would be nice – satisfying even – to put one valid name on them. And… by examining the works of Dall and Bartsch, one can often find numerous – perhaps several dozen – entirely satisfactory species names that will fit within that single collection of specimens from a single species from a single small bay. Dall, W. H. and P. Bartsch. 1909. A monograph of West American Pyramidellan Mollusks. United States National Museum, Bulletin 68. 1-258 pp, 30 pl. This monograph contains 258 pages of species descriptions… And 30 plates of illustrations…. As an example , take a look at this one. This is one of many plates of illustrations showing species of Turbonilla. Turbonilla is one of the genera of pyrams that has species that will attack Tridacna. Do you think you could use such images as these to differentiate between any two them reliably? CORRECTLY IDENTIFIED examples of those species. And, please excuse me, so that I may now go and start beating my head against the wall. Because it will feel soooo good when I quit. Oh… for those of you who might know mammals, the Dall sheep and the Dall porpoise were named after William Healey… AND here is something I will bet you probably didn’t know. His name “Dall” was pronounced rhyme with “Gal,” NOT “Gall,” as it is most often used. See… I even give you a piece of “party” trivia to amuse your friends with. Of course, if you do so, you risk never being invited to such parties again. Raup, D. M. 1962. Computing as an aid in describing form in gastropod shells. Science. 138:150-152. Raup, D. 1966. Geometric analysis of shell coiling: general problems. Journal of Paleontology. 40:1178-1190. Raup, D. M. 1969. Modeling and simulation of morphology by computer. Proceedings of the North American Paleontological Convention. September 1969:71-83. A most interesting and interesting article discussing the problems with identifying stony corals, in particular, some species of Hawai’ian Montipora has recent been published. The background for the article is that last year several parties petitioned to have 83 stony corals to be listed under the United States Endangered Species Act. The National Marine Fisheries Service (NMFS), a branch of the National Oceanic and Atmospheric Administration (NOAA) is charged with assessing the coral species in question to determine, among other things, if they actually are endangered. If the corals are listed, the act is supposed to provide some more protection for the species, and probably most importantly, designate critical habitat for these corals. 1) Is the given species well-enough described to be reliably identified? Keep in mind, that by being listed on the petition, at least somebody thinks the indivual colonies in that species can be identified. 2) If the species is identifable, can it be assessed to determine if it is endangered? Forsman ZH, Concepcion GT, Haverkort RD, Shaw RW, Maragos JE, et al. (2010) Ecomorph or Endangered Coral? DNA and Microstructure Reveal Hawaiian Species Complexes: Montipora dilatata/flabellata/turgescens & M. patula/verrilli. PLoS ONE 5(12): e15021. doi:10.1371/journal.pone. I urge you all to read, at least, the Abstract (= the authors’ short summery) of the article, but I am also a realist and realize that while a few of you will look at the Abstract, and some of you may actually read or download and save the article, most people who scan this blog probably won’t. The researchers examined the genetic codes for a relatively large number of well-known and well-characterised proteins found in the corals’ cells, as well, they also looked at how the subcellular structures called mitochondria vary genetically between the samples. They also microscopically compared, in fine detail, some of the visible physical structures of each specimen. When added together, these different examinations revealed four distinct groupings of specimens (called “clades”), and when each specimen was identified with traditional taxonomic methods, the four clades contained these species: I) M. patula/M. verrilli, II) M. cf. incrassata, III) M. capitata, IV) M. dilatata/M. flabellata/M. cf. turgescens. So, sophisticated statistical analyses of skeletal microstructure and genetics separated specimens of 7 “species,” based on traditional taxonomy, into 4 groups that represent -probably- actual groups. I think whether or not one wants to consider that each of these groups represents a species is probably dependent on how one feels about this type of analysis. To me, yup, I’ll buy in to consideration of each group as representation of a species. The microcharacters of the size and shape of verrucae or papillae were the only reliable physical characters that could be used in identifying the groups, while gross features such as any aspect of colony-level morphology was so highly variable as to be useless. The authors noted that previous studies on how observable structures in corals vary from specimen to specimen have revealed that fragments taken from the same colony can exhibit strikingly different growth forms if grown in different environments. Additionally, the extent of both genetic and morphological intraspecific variation in corals is poorly understood. This is clearly creates problems for assessment of species in the context of the Endangered Species Act as structurally-based taxonomy – not molecular or genetic information – is the current basis for estimating species distributions, abundance, and extinction risk. This study identified no fixed genetic or fine-scale morphological differences between M. flabellata, M. cf. turgescens, and M. dilatata, or between M. patula and M. verilli; in other words, these 5 named species appear to be only 2 natural species. The authors noted that the geographic ranges of these groups are likely to extend beyond Hawai’i into the central Pacific and that individuals within “species” of these complexes are either actively interbreeding (which means they are not separate species), or they are from separate species that are very closely related (e.g., evolutionarily separated within the last one million years) and cannot be distinguished from one another. Now that these complexes have been identified, work is needed to determine if the nominal species within each complex freely interbreed. Unfortunately, this study provides little guidance for determining if these specific species are valid and should be listed under the ESA, but perhaps more importantly; it highlights major gaps in the present understanding of species as opposed to population-level variation in corals. This study is an example of how knowledge of species boundaries in corals is not only necessary for understanding patterns and processes of biodiversity and evolution, but is essential for conservation. One of the many take home messages is obviously that corals are exceptionally difficult critters to identify. Generally, if we choose the proper characters, we can identify them to genus. Beyond that… don’t even try. As it stands now, we have so few data across the range of most tropical stony reef-forming (and presumably, non-reef forming as well) corals, that distinguishing any specific species is an impossible task. Now… for a show of hands… Is there anybody out there that thinks we will change the way we live, 1) at all, or 2) in time to save coral reefs from going the way of the non-avian dinosaurs? Hey, its not all bad, we could start a betting pool as to the year or month when the scientists of that future time could declare that the last coral reef finally wasn’t one anymore! Any regular (if there are any – I really am sorry about the aperiodic nature of the blog, the explantion of that would take too long to write and really isn’t important – but I do hope to do better in the very near future) readers of this impossibly unperiodic electronic space in the aether, have surely noticed my lack of optimism as well. I think many of scientists who voice public optimism are privately much more “pragmatic” than their public utterances seem to imply and in some – few – cases I have heard about, almost suicidal from the depression and grief of being in the position of observing and documenting this aspect of what is now becoming known in the paleontological community as “The 6th Extinction.” — The name derives from an examination of the fossil record, wherein there are 5 major extinction events that punctuate the history of life. On the plus side, so far… life has always recovered and rediversified after these extinction events. On the negative side, once the cause of the event has been removed, that recovery has always taken tens of millions of years. Evolution is sure and certain – but to refill a lot of “vacant ecological niches” takes a lot of time. And young people today will get to see another interesting phenomenon, where 30 or 40 years from now, new students of marine biology will see this changed (and to my – by then- long dead eyes) and depauperate, truly ghastly, world as “normal,” the status quo; rather like tourists who now go diving for the first time on (the pathetic algal covered ruins of) what used to be the coral reef at Cozumel or other Caribbean vacation spots, and think they are seeing a thriving coral reef. This is what Jeremy Jackson, now one of the “grand old researchers” of the Caribbean coral reefs refered to, in 1997, as “sliding baselines.” (The underlined emphasis is mine, to emphasize that this has happened to me, too). “The problem is that everyone, scientists included, believes that the way things were when they first saw them is natural. However, modern reef ecology only began in the Caribbean, for example, in the late 1950s when enormous changes in coral reef ecosystems had already occurred. The same problem now extends on an even greater scale to the SCUBA diving public, with a whole new generation of sport divers who have never seen a “healthy” reef, even by the standards of the 1960s. Thus there is no public perception of the magnitude of our loss. And now, on the cusp of 2011, it is ever so much worse. We live in a sick world (in all senses of that phrase) run by an aggregration of dunces. It is time for my usual and periodic rant about the idiocies apparent in the coral reef aquarium hobby. The particular thorn-in-the-paw that has set me off this time is one of the usual ones that have been beating around the scientific blogosphere over the last year or so; specifically, the lack of scientific literacy amongst the public – or in my case, the particular subset of the public that I sometimes interact with – the average aquarists I try to advise, or work with, or write for. I have to throw in a caveat here; there are a fair number of very good aquarists, who can actually look up articles, and act upon what they read. However, they are a small subset of the total number, and are the exceptions rather than the rule. If you count yourself amongst this group, and have actually read something in the peer-reviewed literature, I hope the rest of this diatribe does not offend you. I suppose I may be guilty of one on the mistakes I warn my readers about, that being making unwarranted generalizations. Still… It seems like trying to introduce common good husbandry based on scientific knowledge practices to the majorit of this group of folks is a useless task. Nothing I propose is based on anything other than scientifically determined facts and good common sense, buttressed by those facts. Most of the time following the suggestions would save a lot of money. In all cases, it would result in healthier, longer-lived animals. And after 15 years of doing this, I think I could count on the fingers of one hand the number of people who regularly correspond with me who seem to “get it.” And, even though there are probably more, the fact of the low numbers is damned discouraging. Gresham’s law in economics states that “Bad money drives out good.” Basically, if two types of currency circulate simultaneously, and their exchange rates are governed by law, the artificially overvalued money tends to drive the other, artificially undervalued, or “the more valuable or good,” money out of circulation. In the aquarium hobby world, it is the artificially overvalued advice, mostly advertisments, but some other advice as well, drives out or submerges the artificially undervalued advice, that based on scientific evidence. One probably shouldn’t take this analogy too far, but it works pretty well on the short run. Advice that is overvalued is that which is continually trumpeted by advertisements. This advice is everywhere in short bursts, it is easily learned, and it is often repeated by people who don’t know how to test or evaluate it or probably more correctly, don’t care to test or evaluate it. As we all know, continual exposure to a patent falsehood claimed to be true will result in that falsehood being accepted as the truth by the majority of the audience exposed to the repeated message. This was discovered and explicitly stated by Joseph Goebbels, and has been exploited by every propagandist since then. Of course, it was probably intuited by every natural-born scam artist since the first travelling caveman sold defective obsidian on his way through an ancient valley. And it continues to be inuited today, and exists well in the advertisements aimed at aquarium hobbyists. The undervalued advice in my example, scientifically determined knowledge, requires the recipients to think about it and to implement it often in the face of an overwhelming amount of contrary advice. That is hard to do, particularly when the recipients are today’s typical Americans who have never had any training in how to evaluate ideas or claims, and whose knowledge of science and the scientific method have been formed by shows such The X-Files. There are numerous examples of how idiotic advice seems to rise to the top in the aquarium hobby, but my favorites for today are the use of strontium and iodine as additives in aquaria. Strontium is a known coral poison affecting calcium metabolism. It has been demonstrated to reduce calcium transport across the coral’s surface membranes, and that is definitely not a good thing. Fortunately, it doesn’t kill corals outright, and the the concentrations found in natural sea water, evolution has given corals the ability to detoxify it. Still, adding it to an aquarium, to “boost” coral growth is not a really sterling example of the intelligence of the average reef aquarist. Then there is the addition of iodine. This material, often added in one of the many formulations called Lugol’s solution, is an essential material, in very small amounts. The amounts necessary in a reef aquarium are so tiny as to be effectively unmeasurable. Excess amounts of iodine are amazingly lethal. Like many budding scientists who worked in freshwater systems, I learned about Lugol’s solution in my limnology classes, where it was used as a preservative. Yeah, that’s right. A preservative, a material used to kill organisms and make them so toxic that nothing could eat them. Good stuff, to be adding to one’s aquarium, to be sure. Especially as it is impossible to hobbyists test for iodine in aquaria as it has exceptionally complicated chemistry and no cheap test kits are available. But that doesn’t matter, as you see, we all know that iodine is essential for crustaceans. Particularly because it is necessary for crustacean molting. Necessary for molting in crustaceans… You know, crustacean molting has been investigated in great detail by arthrophysiologists for as long as there have been scientific arthropod studies. This is well over 100 years, and there is an amazing body of literature about the chemical aspects of molting in crustaceans. Litereally, there are thousands of articles. Turning to the Advanced Search in Google Scholar to get an estimate of the number of articles turned 11,800 hits, about 210 of these articles contain a mention of iodine. A few of those discussing iodine inside the molting fluid and in the water outside the animal, along with all other ions the researcher could measure, but most of the mentions of iodine were as a component of various testing chemicals, not normally found in the animal but used as a reagent to indicate some other factor. One would think that if iodine were necessary for crustacean molting, there would be a plethora of articles describing its action. There are for every other necessary chemical, such as 3,820 for phosphate, 3,210 for copper, 2,680 for iron, 2,520 sulfate, 4,080 for calcium. Iodine zip… Search engines turn up a lot of false positives, and depending on how one queries for iodine, hits can be found. But, when those articles are examined, NONE of them discuss iodine as a necessity for molting. Negative evidence is, of course, difficult to deal with. The old saw, “Absence of evidence is not evidence of absence,” remains as sharp as ever. Still, one would think that somewhere along the line, if iodine were a requirement for arthropod molting, some researcher over the last century would have found it. Anecdotal stories from aquarists seems to indicate that iodine supplementation seems to cause some changes in molting. My suspicion, my very strong suspicion, is that iodine poisons the molting process and causes premature molting. Repeated iodine forced -molts result in premature death. At the very least. Now, I would love to be shown to be wrong. But, I am not going to hold my breath waiting for such evidence to appear. Below are some references about strontium in corals, they are all worth reading. It is particularly enlightening to read the first two, and then the rest. The first one tells how increasing strontium causes increased growth in corals. The second one tells how that growth was an artifact of the experimental system. The first one is used by incompetent aquarists to support their supposition about adding strontium. These aquarists are incompetent because they didn’t read the next article. And the subsequent ones. Of course if you want to read an article in the scientific peer-reviewed literature detailing with the necessity of iodine in crustacean molting. You will have to find it. I couldn’t. On the other hand, the aquarium version of Gresham’s law is alive and well, just check out any aquarium vendor and their online advice about iodine and strontium. Swart, P. K. 1980. The effect of seawater chemistry on the growth rates of some scleractinian corals. In: R. Tardent and P. Tardent (Editors). Developmental and Cellular Biology of Coelenterates. Proceedings of the Fourth International Coelenterate Symposium. Interlaken. pp. 203-208. Swart, P. K. 1981. The strontium, magnesium and sodium composition of recent scleractinian coral skeletons as standards for paleoenvironmental analysis. Palaeogeogrraphy, Paleoclimatololy, Paleoecology. 34:115-136. Chalker, B. E. 1981. Skeletogenesis in scleractinian corals: the transport and deposition of strontium and calcium. In: S.C. Skoryna (Ed.) Handbook of Stable Strontium. Plenum Press. New York, pp. 47 63. Ip, Y. K. and P. Krishnaveni. 1991. Incorporation of strontium (90Sr2+) into the skeleton of the hermatypic coral Galaxea fascicularis. Journal of Experimental Zoology. 258:273-276. Wright, O. P. and A. T. Marshall. 1991. Calcium transport across the isolated oral epithelium of scleractinian corals. Coral Reefs. 10:37-40. Greegor, R. B., N. E. Pingitore, Jr. and F. W. Lytle. 1997. Strontianite in coral skeletal aragonite. Science. 275:1452-1454. Posted in Reef Aquarium Questions Answered | Comments Off on Why? I have been going from a bare bones, sorta, tank back to something that is an approximation of a natural system. My aquarium is nothing I would call a reef tank a the present time, more like the emulation of a habitat someplace near a reef. In other words, no stony corals, yet. And probably not for a long time. For the last couple of years my system has mostly been focused on maintaining my research animals. And it had been an adequate system, as far as it went, it just wasn’t the most aesthetic aquarium of all times. In fact, it was pretty much the other extreme. To a large extent, this condition was due to my health problems, which finally seem to be fading a bit. I simply didn’t have the time to maintain it properly. I have been in the process of converting my aquarium into a more attractive system designed to maintain and support my research beasties of the present, my Diodogorgia colonies. Now, like any good scientist, I don’t want to spend any more time than is absolutely necessary in this exercise. I am NOT one of those aquarium hobbyists who spends all waking hours puttering around his/her system. Nope. I want to put the animals in the system, and sit back and enjoy it as I can, relaxing… Not working. My research has shown that Diodogorgia colonies need strong, and more-or-less laminar currents to feed well. It just can’t capture prey very well in either particularly slow currents or stagnant situations, nor in strong currents that are irregular, the type of water flow generated by so-called wavemakers, and oscillators. So I have created a Diodogorgia gully along one side of my system with the wall of the aquarium being one side, and live rock being the other. At one end of the aquarium, I have three relatively powerful powerheads to create the current. I can’t, in this situation, use propeller type pumps, because the ones I have create a noise in the tank that irritates my spouse – apparently anywhere in the house (and, it is a noise I can’t hear, sigh…) . So… a compromise, but it seem to be working so far. Yesterday’s event of notice was the arrival of a shipment of sand bed and “maintenance” critters from Indo-Pacific Sea Farms. I been periodically purchasing this type of critter from this vendor for over ten years, and other than the fact that some of the animals are misidentified (more about that below), I have nothing but good things to say about the operation. The animals arrive in good order, ALWAYS. The animals arrive in labeled bags, ALWAYS. And the animals are reasonably priced, ALWAYS. 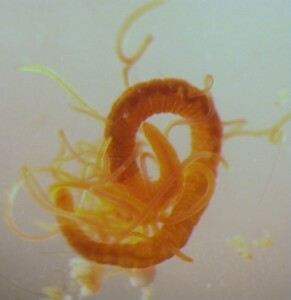 Yesterday, I got a shipment of “bristle worms” – amphinomids or fire worms, the classic scavengers, some of their “Mama Mia” worms – these are cirratulid worms, not terebellids as it states on the webpage. See this online article to tell the diffence between the two types of worms. Nobody in the hobby, as near as I can tell, actually sells terebellids, but many folks misidentify cirratulids as terebellids. Folks, the presence of a lot of tentacles isn’t the sole diagnostic characteristic for a terebellid, those tentacles have to arise from a specific body region and the whole worm has to have the proper morphology. Similarly with the cirratulids. These two types of worms are NOT hard to tell apart. This is one of the cirratulids I got from IPSF. They do well in a good sand bed and are great detritivores. I also got some mini-stars, small brittle stars, and some of the the “miracle mud,” some sediment containing real microscopic sediment critters, as a recharge for my sand bed. This latter stuff is what live sand should be when it is sold, but other than IPSF, I don’t know of any vendor that actually sells it. Finally, I finished off my order with some good grazing snails, three of the Trochus IPSF sells, and an order of grazing columbellids. Although IPSF calls the latter Strombus maculata, they are clearly not a strombid. However, that misidentification doesn’t get in the way of their grazing abilities, which are truly awesome. These little snails are probably a species of Euplica, but that is really not important. And here is an article that discusses the differences between the columbellids and the conchs (= strombids). Again, they are not hard to tell apart, and the columbellids are really the best grazing snails in the business; additionally, they survive far better in reef tanks than do strombids. This is one of the columbellids added to my system. See the linked article for differences between these animals and conchs (strombid snails). Finally, and the thing that makes IPSF a REALLY great place to buy from, is that all of this stuff is aquacultured. They raise it all. YES!!!! A marine aquarium animal vendor that is doing business like it should be done. I had a heck of a good time yesterday adding all of these animals and a few other things, some algae, besides to my tank. Any recent visitor to my “expert” forum on the Marine Depot site may have noticed a new posted note about feeding – and about the language. More to the point, not just about the language, but about the use of words that seem on their way to becoming ubiquitous amongst reef aquarists. These are the “invented” words that form from unfamiliar terms, such as “algae,” giving rise to algaes (sic) by itself, or in the combined forms: micro- and macro-algaes (sic). The case that pushed me over the edge this particular time was zooplanktons (sic), supposedly – I think – as a plural word for a zooplankter, a single zooplankton entity. However, I will point out, I couldn’t discern from the sentence where it was used, what the writer meant. Arrgh!!! The marine aquarium hobby is an expensive undertaking, this generally means that two types of people become hobbyists: those who can easily afford it, and those whose interest in the animals/hobby is so great that they make all sorts of sacrifices to participate. As one might expect there are relatively few of the latter folks, although in many cases, when one can identify them, they often are amongst the more knowledgeable of hobbyists. The point of this statement is that to be able to afford such a hobby, one often has to have a well-paying job, and following this train of thought to full derailment, such jobs are often domain of people that have a so-called “good” education. So… why are so many of these people illiterate? Probably the word in this regard that captures most people is “algae.” People see the word and kinda, sorta, somehow get a warm, fuzzy, or cold, slimy, idea of what algae means; all the time not realizing that algae is a plural term. More than likely this is because the original user of the word, hasn’t a clue about the word, either. It is really interesting, and more than a little disheartening, to read something one of these people writes and to realize that they don’t have a frigging clue as to what any single alga is. Let alone what many algae are. They have no conception that algae are not plants – but, hey, don’t try to pin them down on what a plant is, either. You really don’t want to know what they think it is. The marine coral reef aquarium hobby is by some sort of necessity technical. It has to be, there are no common names for many of the organisms, and most of the techniques for maintain the organisms verge on being complicated culture methods requiring more than a little bit of scientific or technical background. While there are many aquarists who are very well versed in the sciences or engineering, there are unfortunately quite a large number of wannabes who just don’t have a clue about what they need to do to keep their organisms alive, or for that matter what their organisms even are (oh, they may use a name, they just don’t realize what the name implies). The sad part of all of this is that they, in most cases, already have the organisms as they have purchased some critters and some equipment because of some smooth-talking salesperson. Generally, the budding aquarist seems to think they have something like a gold fish (hey, the fish they have is golden… that make it a gold fish, right?). And the equipment they purchase, instead of being a set of expensive devices specifically tailored toward keeping these strange creatures alive, is simply a series of “black boxes” of unknown and unknowable function. All our aquarist has to do is to follow some simple instructions, and their animals will be thriving. Sigh. It is hard to tell who is more to blame here; the clueless individual or the mercenary salesman. One would like to think that people don’t view these beautiful living things as disposable, but all too many of them have the asinine philosophy that animals are put on Earth for man’s benefit, another unfortunate piece of garbage thought spawned by our dominant religions superstitions. In this case, who cares if one doesn’t know how to take care of the animals properly, it is no big deal. One would like to think that people would try to learn about keeping these organisms before they purchase them – and to the credit of many, they do. But far too many don’t. These are the people who can’t read enough to know that they don’t know what one alga does, let alone what many algae mean in the context of a marine aquarium. I will beat my head against the wall, ’cause it will feel SOOOO good when I stop.